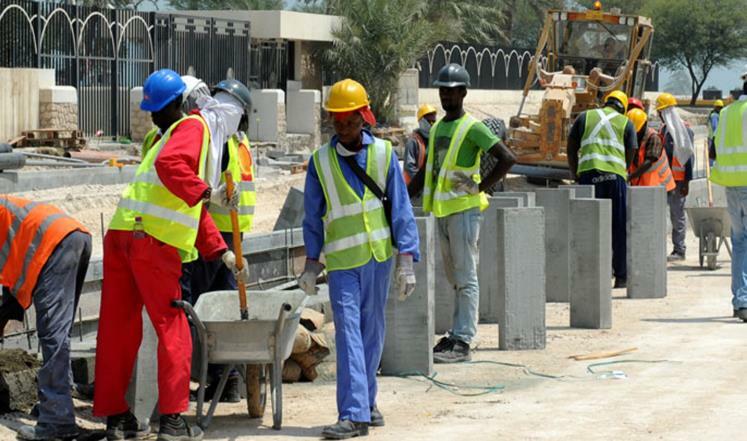 Geneva - The Euro-Mediterranean Human Rights Monitor calls on Qatari authorities to carry out further reforms and revisions to legal legislation which regulate the rights of migrant workers in Qatar and guarantee their rights. While praising the progress made in some aspects of legislation and procedures for migrant workers in Qatar, Euro-Med stresses that these changes "are still below the required levels and that further adjustments should be made to comply with human rights, especially labor rights." Euro-Med pointed out that it has registered several violations by Qatari employers and companies due to the law governing foreign workers in Qatar, which have forced some workers to work under the sun in a manner that threatens their lives in addition to their work for long hours. For these reasons and more, Euro-Med calls on the Qatari authorities to provide the necessary guarantees to implement the amended legislation on the ground and obligate employers and companies to implement them, and to impose punishment on violators. Euro-Med calls on the High Committee for Projects and Heritage, the committee charged with overseeing the implementation of workers' welfare standards and ensuring their health and safety in projects under their supervision, to take more practical steps to ensure the rights of these workers, including personal safety. Some reforms have been made in the laws and regulations governing the employment of expatriates, but human rights problems still exist, particularly where the travel of a foreign worker is still subject to the consent of his employer in most cases and where the employer may retain the passport of the foreign worker after obtaining the employee's consent, which opens the way for exploitation and control of the worker who often complies with the employer's desire to take his passport. Any work to another job isn't allowed without the consent of the employer, and such prohibition can be applied for up to five years on the terms of the contract of work. Euro-Med calls for providing all necessary legal and procedural means to provide security and safety guarantees for the lives of workers at risk due to their work in the heat and humidity in the country, stressing that these actions will ensure continuity of work in a friendly environment conducive to assistance and productivity. In light of the increase in the number of foreign workers, estimated at 1.7 million people, the Qatari authorities are demanded for further reforms and revisions of their legal legislation governing foreign labor in order to guarantee their rights, especially in the workplace. The Euro-Mediterranean Human Rights Monitor stresses the need to take serious action on the deaths of expatriate workers over the past years and to build on the results of the investigation committees, and calls on the Qatari authorities to develop national legislation that guarantees the rights of expatriate workers, pointing to the Universal Declaration of Human Rights and the International Covenant on Economic, Social and Cultural Rights, which affirms the right of everyone’s rest and leisure, and the reasonable limitation of working hours and periodic holidays with pay, in addition to the provisions of the ILO Convention that provide effective protection to every worker while earning their living.